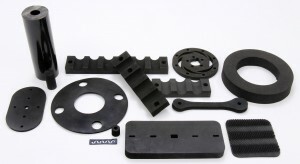 Selecting the right rubber material for your application involves asking and answering a series of questions. For example, do you need a rubber compound that can absorb or transmit energy? Do you need a specialty elastomer that meets FDA requirements, or that provides EMI/RFI shielding? Rubber compounds can also seal or transmit fluids, absorb vibration, and dampen sounds. Interstate Specialty Products die cuts numerous non-metallic materials, and can help you source the right elastomer for your application. 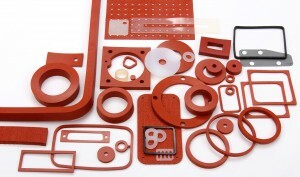 For over 50 years, our Made in the USA manufacturing company in Sutton, Massachusetts has been die cutting custom rubber products such as seals and gaskets. Every application is different, but understanding the basics of rubber selection is always important. Rubber materials differ in terms of physical, chemical, mechanical, and material properties. Published specifications such as ASTM D2000 provide a standardized way to describe vulcanized rubber, and ASTM D1418 – 10a specifies a general classification system for various elastomers. For product designers and engineers, however, relating a rubber’s properties to application requirements is what’s critical. For example, gasket materials include synthetic rubbers such as neoprene, nitrile (Buna-N) silicone, EPDM, Santoprene, and Viton. Natural rubber and fabric supported rubber are also available. During compound selection, you may need to consider requirements such a rubber’s resistance to abrasion, chemicals, flame, heat, oil, water, ozone and weathering. Some gasketing applications require resistance to specific acids, bases, or oils – and for different periods of exposure. 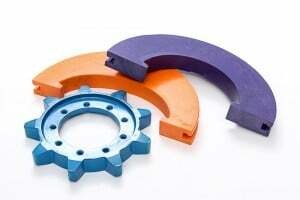 Other custom rubber products require an elastomer with outstanding dielectric strength. Tensile strength, hardness (durometer), compression set, elongation at break, and minimum and maximum service temperatures are also important properties to consider. Natural and synthetic rubbers also differ in terms of cost, a key consideration in most applications. Meeting regulatory requirements and industry standards is often essential, too. For example, medical gaskets may need to comply with USP class VI requirements. Acoustic mesh for electronics may have to meet IP64 standards for ingress protection (IP). Interstate Specialty Products is ready to answer your questions about rubber selection, and to recommend precision die cutting or digital die-less cutting for your specialty rubber parts. To learn how our custom manufacturing capabilities can support your application, contact us on-line or call (800) 984-1811.